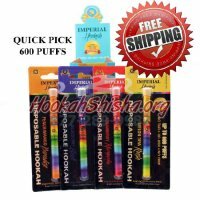 The legendary Khalil Mamoon has long been recognized as the creator of some of the highest quality hand made hookahs to ever come out of Egypt. They are famous for their authentic and beautiful Egyptian craftsmanship, sturdy design, decorative and unique hoses, and their smooth but powerful draws. This unique 30" hookah has an expertly crafted chalice style stainless steel shaft and comes with an ultra long (72") luxury hose to match the hand painted extra large vase, built is as sturdy as they come, which completes this marvel of hookah craftsmanship. Another expertly made Khalil Mamoon hookah masterpiece.